A good way of getting a clear outside view is to use cafe blinds. They are perfect if you don’t want your view of a vista or garden to be blocked, but still need to have protection from bad weather. We sell PVC outdoor blinds that are made from very durable and high quality PVC plastic that provide your outdoor living area with a very stylish addition. Our product is very durable and provides you with an unrestricted view since there are no ropes, straps, pullies or stitching that will obstruct or hinder your view. 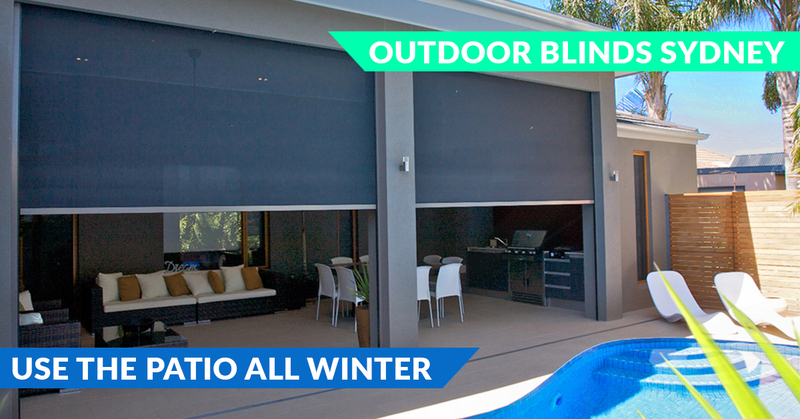 The outdoor blinds provide 20+ SPF protection from the sun and block the wind. If you are looking for the best patio shading while at the same time providing a barrier against weather and insects, then zip screens are ideal. There are specially designed tracks that the fabric is locked within which prevents unwanted light or insects from entering into the area. In addition, zip screens can serve as a block blind on your patio when combined with block out fabric. Our line of External Plantation shutters have been designed to provide you with a robust and stylish privacy solution. The versatile shutters provide you with the flexibility you need to maximise on your outdoor area without needing to sacrifice on your home’s design element. Ideal for enclosing both patios and balconies, they not only look fantastic, but provide weather protection and privacy as well and allow you to enjoy an alfresco area in all seasons. This type of awning is mounted onto a wall and then extend out to cover a patio, deck or other outdoor area as needed. In this respect they can thought of as a kind of roofing. When you aren’t using them, they retract away safely inside of their slim housing. Retractable awnings can be operated automatically (by pushing a button) or manually. They are also available in a variety of patterns, colours and fabrics. If you have any questions about our blinds please feel free to send us a message. A connection with the external and external view on demand via tilted venetian slat while still preserving your privacy. When the level of light goes down you can automatically retract your venetian blinds so that they are completely out of sight. There is also easy access to clean the glass. The blade surface has a shallow curve which compliments modern architecture’s fine lines perfectly. The coated stainless steel cables or slimline extruded aluminum rails are used to guide the slats. You can use timber blinds on the outside of your home as well as the inside. Different kinds of timber blinds can be used in your outdoor areas. Timber louvre blinds are just as popular as plantation shutters. Another option you may want to think about is to use bamboo blinds. When timber is used for your outdoor blinds allows you to enjoy the natural beauty and warmth of timber while being able to still control how much privacy and light you have.